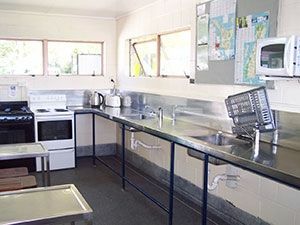 We provide a variety of accommodation to suit all budgets from small backpacker cabins through to larger units with own bathroom and kitchenette suitable for families. All our accommodation is non-smoking. Although we allow pets on our campsite we do not allow anyone to check in with pets into the units. There is parking available for 1 vehicle outside each of the units. 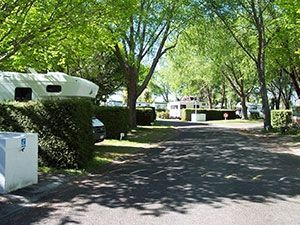 We are able to find additional parking for a trailer but we would need to know at time of booking. The units are all detached and are located in 4 areas of the park. The plans provided are for example only; each layout may vary slightly. We are happy to take group bookings, however special terms will apply; these are available on request. For group bookings no bedding whatsoever is supplied. Minimum rates and minimum nights stay may apply during peak periods. This unit has 2 separate bedrooms, one with a double bed and the other has 2 sets of bunk-beds. It has a main lounge/kitchenette with a TV, sofa-bed, dining table and chairs. The kitchenette has a table-top cooker, microwave and fridge. There is a small bathroom off the main lounge. Also provided are an electric jug, toaster, crockery and cutlery for six people. We only provide a fitted bottom sheet and pillow on each bed. Please advise us at time of booking if you wish to hire additional bedding ($6 per person) or towels ($2.50 each). 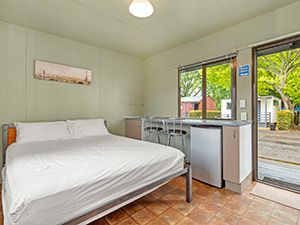 This unit has 1 double bed, TV, table and chairs and a small kitchenette. In the kitchenette there is a fridge and microwave. Also provided are an electric jug, toaster, crockery and cutlery for 2 people. There is a small bathroom off the bedroom/kitchenette. We only provide a fitted bottom sheet and pillows. This unit has 1 double bed and 1 set of bunk-beds. In the bedroom there is a TV, table and chairs and kitchenette. There is a small bathroom off the bedroom/kitchenette. The kitchenette has a table-top cooker, fridge and microwave. Also provided are an electric jug, toaster, crockery and cutlery for 4 people. 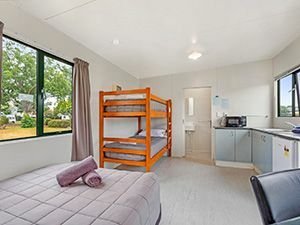 This style of unit has 1 double bed and 2 sets of bunks-beds. There is also a TV, fridge and table and chairs. Also provided are an electric jug, toaster, crockery and cutlery for 6 people. You will need to use the main amenity block for bathrooms and kitchen. There is no running water to the unit. 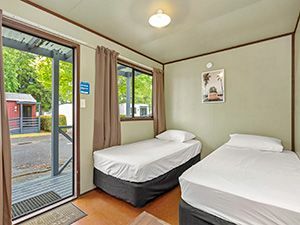 This unit has 1 double bed and 1 set of bunk-beds. There is also a TV, fridge, table and chairs. Also provided are an electric jug, toaster, crockery and cutlery for 4 people. This cabin has 1 double bed, fridge, TV, and table and chairs. Also provided are an electric jug, toaster, crockery and cutlery for 2 people. This basic cabin has 2 single beds and table and chairs. There is an electric jug, toaster, crockery and cutlery for 2 people also provided. You do not have to share this unit if only 1 person makes a booking.